The plot below allows risk to be displayed in relation to two variables. The contours on this plot are derived from a non-linear model fit to the data. What we see is that there are regions where slightly below average growth in the first year results in higher mortality than lower growth, even though the general trend is for higher birth weights and higher growth rates to result in lower mortality. This effect would be hard to detect in a conventional analysis of statistical significance. 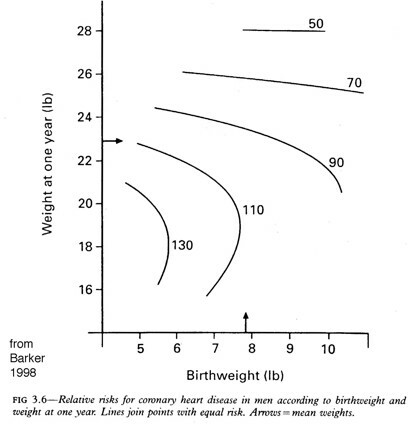 This entry was posted in general and tagged Barker, birth weight, contour plot, conventions, statistics. Bookmark the permalink.